I want to go to there... Jurassic Sweet Park. Alejo Malia has put together a mash up between Jurassic Park and Ben and Jerry's. I don't know if these will end up really becoming ice cream, though it'd please me if they did, because I want them in my belly. 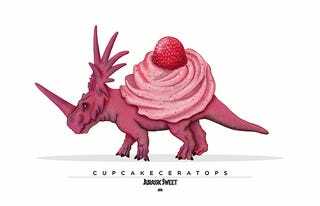 More of the delicious icecreamsaurus on Behance. And a hat-tip toward Mary Sue, where I first saw these.